Captions make it easy for viewers to digest the content of your videos. They’re a critical part of accessibility, but they are also helpful for longer form and educational content in any language. Wistia captions are also interactive, which means they’re searchable and viewers can jump right to a certain point in the video by clicking on a section of subtitles. Whether you’re trying to make sure people can get the message of your video (even without the sound), looking to expand your viewer base with multilingual captions, or just searching for a little more love in the video SEO department, Wistia Captions can help. Let’s jump in to creating and using your captions! 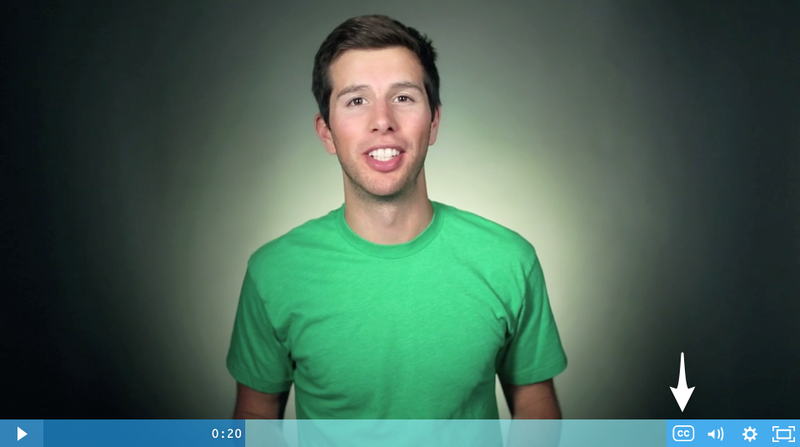 It’s not currently possible to order a set of captions for Soapbox videos exported to Wistia. This is a technical limitation due to Soapbox videos being two separate video feeds compiled in the Wistia player. If you want captions on a Soapbox, you can upload a custom SRT file. First, navigate to the media page for the video you’d like captions for (the page where you can play the video in your Wistia account). Under the ▸ Video Actions menu, select the Customize option. From the Customize panel, select the Captions settings area. This will turn captions on ◉ for your video. 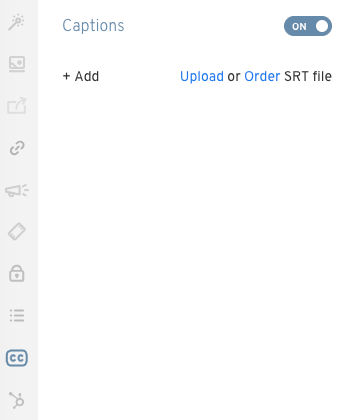 If you already have an SRT file ready to upload, select the Upload SRT option. Be sure to format the SRT file correctly, using our guide below. Ordering captions is only available for accounts with a paid Wistia plan. Free accounts cannot request captions, as it requires having a billing profile with a credit card on file. If you want to skip time and task of making your own SRT files, the Captions menu has options for ordering a paid transcription. Select the Order link in the Captions menu to see the available options. For the most up-to-date pricing, refer to the captions panel where you can review the per-minute cost before you make an order. The Professional Captions option is rated at 99% accuracy. The initial draft is machine generated, then the captions are edited by humans and go through a final, human review 👩‍💻. Default wait time for the Professional option is 4 business days, with the option to expedite the order and receive it within one business day for an additional cost. Automated captions are rated at 80% accuracy, with the added benefit of being ready in minutes. This purely machine-generated transcript comes at a reduced cost, and they’re a great way to save time and cost if you don’t mind doing your own review. Want captions turned on for your video as soon as the transcription is ready? You can choose this option when ordering. If you’d prefer to review the captions before they go live, make sure to uncheck the Automatically Enable Captions box before you press Place Order. 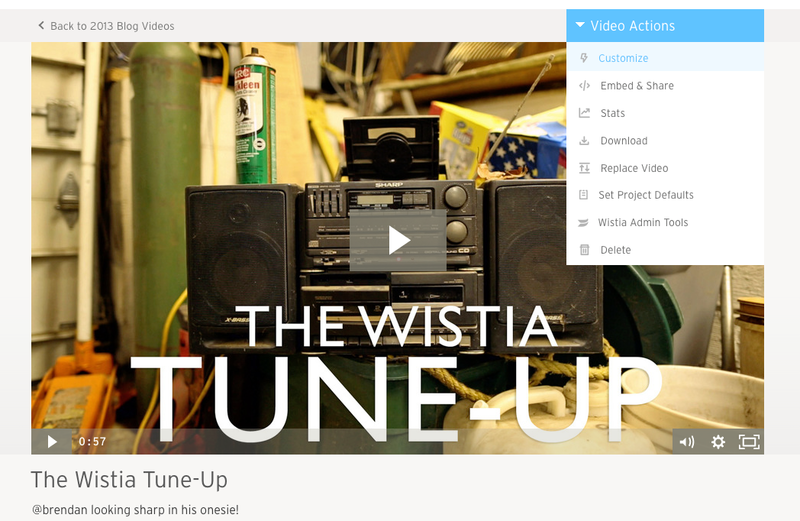 We’ll send you an email from alerts@wistia.com to let you know when the captions are ready! To learn more details about how transcription works, accuracy rating, etc, you can read up on the process by our partners at 3Play Media. Once your captions are live, the button will appear to all viewers who watch your videos. The captions will now be injected into the metadata of your video when using the Standard Embed. To learn more about Video SEO check out our help page. To customize your video with captions, select Customize from the Video Actions menu. Open the Captionscustomization area. 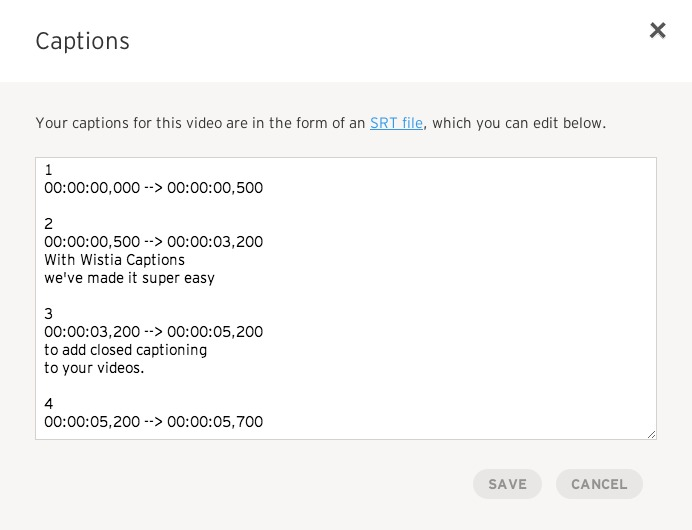 Inside the Captions customization area, you can choose to Edit, Download, or Delete your SRT file. You can upload as many SRT files as you’d like to your video. Spanish, English, French, Croatian — the more the merrier! Wistia allows for multilingual captions, and you’re only limited by your imagination (and maybe fiction — those Klingon captions won’t work 👽). 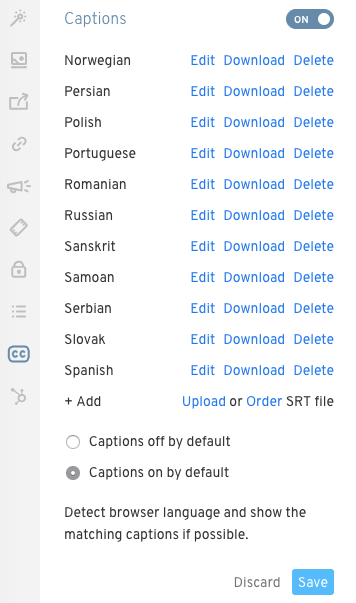 Right now Wistia only allows you to order captions in English, but if you have an SRT file in another language upload away! If you’re using a right-to-left read language, you’ll need to accommodate for the flip that takes place in many internet environments. Wistia flips right-to-left captions by default, so building captions to account for this is the easiest fix. If you’d like your captions to be turned on permanently, now’s your chance! Just choose captions on by default from the Captions menu in Customize. If you’re working with multilingual captions, we’ll supply the captions that match the language of your viewer’s browser. If those captions aren’t available, we’ll serve the first SRT file uploaded (the first in the list). If you spot an error in the automated captions we produce for you, or just need to update your SRT file, you can do that easily by selecting the Edit option in the Captions area of the Customize panel. Make sure to keep the timing in line! If you update the content of your video, the timing may have changed. Make sure to note that in your SRT file! SRT stands for “SubRip Text,” which is a basic subtitle format. If you’d prefer not to order your captions through us, SRT files can be created and edited using most text editors. The maximum line length we recommend for captions is 32–40 characters. This will keep your subtitles easy to read, and prevent text from being cut off or wrapping to the line below. The number for each subtitle (begins with 1). The beginning and ending time for each subtitle, formatted as hours:minutes:seconds,milliseconds, and separated by -->. There should be one space between the starting time and the -->, and one space between the --> and the ending time. The subtitle text. This can be on one or more lines. A blank line before the start of the next subtitle. Want an example? Sure thing! language to your Wistia videos. This message will point you right to the line that needs fixing so you can edit it as needed. Save your edits and try uploading again. Are your captions formatted correctly, but still getting rejected? You might have an em-dash! An em-dash ( — ) can sometimes be inserted by word processors if you double tap the hyphen key (-). Depending on your text editor’s font, a timing arrow with an em dash can look identical to a correctly formatted one. Here’s a quick example: --> , can actually be — -> ! You can check for these by pasting a sample time stamp into another text field. These are also easier to pick up on with an automated captions checker. Speaking of the Champs, if you’re having trouble working out the exact issue with an SRT file, you can always reach out to support@wistia.com for assistance!